Long before the Access Hollywood audio tape came to light, two American friends were convinced that Trump wouldn’t win the Presidency due to his inexperience, unconventional methods, divisiveness and often blunt rhetoric. During our conversations, they couldn’t even envision the possibility. As a salesman most of my career, I had seen the media dominance and showmanship that had earned Trump the Republican nomination rather easily and knew early on that his strong selling skills and powers of persuasion could win him the White House. I had seen that same Trump at Manhattan parties in the 1990’s, on TV and in his book ‘The Art of the Deal’. One friend proposed an immediate bet (he took Clinton) and I accepted. I had forgotten about our wager until he wrote this on November 9, 2016. After the aforementioned audio tape, I had a change of heart about my earlier prediction, as I was sure Trump’s awful words about women would doom him, despite previous missteps that had not. The tape would have spelled disaster for any standard politician, although the mistake many of us kept making about Trump is thinking that he would be held to the same standard of accountability. Not surprisingly, Trump absorbed the negative blow, pivoted (he made the story about Bill Clinton’s past indiscretions) and moved back to the message and progression of the biggest sale of his life. "The main job of an effective salesperson is to close the sale, in this case winning the election. Often that takes adapting or changing one's style in order to progress or enhance the sale. Trump has not shown the willingness or discipline to reach beyond his comfort zone of supporters, thus making it tough to attract new voters. Great salespeople do what it takes and rarely miss a golden sales opportunity, especially when the light is shining brightly and the pressure is on." Questioning Trump’s past rhetoric or future actions is valid and should be done, but we ought to be careful the next time we doubt his ability to sell a policy, program or his vision, as few can equal his talent in that regard. Trump knew exactly what he was doing in the General Election, with most believing he had little to no chance of winning. With limited political experience, less political funds and a boatload of consistent controversy, he won the most influential job in the world - almost solely on being persuasive and selling himself. Trump often avoided the facts (usually saying what he wanted), which worked for him, as he probably knew his supporters wouldn’t care. Yes, he had strong themes that resonated (Build the Wall, Repeal Obamacare, etc), but the crucial selling point was convincing Americans (particularly the white working class) that he heard them, understood their issues and would take care of their problems. He was laser focused primarily on his core supporters (base); something I thought was a detriment yet turned out to be the perfect strategy. Keep in mind that a good portion of his base also voted for Obama previously. A childhood friend had been telling me about the Trump phenomenon from our home state of Pennsylvania (PA) since last summer. He lives on the rural outskirts of a diverse city and saw early on that Trump’s message was resonating. My friend is also one of the most well-rounded, caring and giving individuals I know. Sorry but you are really out of touch with middle class America. Wait until the election….a Ronald Reagan moment. I will thank God and so should you for Trump saving our country. That was brilliant by the way…to get every news network to cover him talking about decorated veterans and then at the end say…well since Hillary started this (birther conspiracy) in 2008…I will end it. Very smart man. The media wants people to believe he is losing but reality is the silent majority is Trump…Go Trump. But it will be a big disappointment when TRUMP wins and all the media and polls can’t figure out how it happened. All my college educated and non-college educated people like Trump……these are family and friends along with those I don’t even know well. I think you are wrong on this one too. You are underestimating his (Trump) power and how many people dislike the current direction with the Dems. I see a movement happening now. The locker room talk is old and got no traction. Everyone is stepping up and he is improving…Go Trump. I think Trump is bullet proof like Ironman. It won’t matter. TRUMP never loses at anything. He’s a winner. He’s going to make America win again. There is a bigger silent majority than I even thought. Many many people. I just asked a few friends and again they know no one voting for her. I was driving my kids to school today. I counted over 80 Trump signs and 3 Clinton ones. In about 4 or 5 miles. 25,000 last night for Trump. Lines a miles long and 7,000 people outside. There is passion like people had for Obama in 2008. That’s why he will win. Clinton has none of that. Although I visited Pennsylvania twice in the last year, I haven’t lived in America in over a decade, thus giving me limited awareness of the Trump appeal. Despite trusting that my friend’s voice and opinion made perfect sense, I couldn’t bring myself to think that he would have enough support to beat Hillary Clinton; especially with an Electoral College that highly favored the Democrats. Another missed factor for Trump was the ‘hidden’ voter; fed up and frustrated citizens my PA friend had been telling me about for months, as several were in his own family. These were folks who planned to vote for Trump yet didn’t show any kind of public support for fear of being labeled a racist or portrayed in a negative light. I can personally attest to these silent voices, as I was in a roomful of kind and fun people (20-30+) on several occasions during my PA vacation and found out later that 95% of them were Trump supporters. Reflecting back on my interactions/discussions with many, the name Trump rarely crept into the conversation. My initial gut feeling was right and my PA friend’s insight couldn’t have been more precise. In addition, he never faltered in his belief that Trump was going to win. One thing we can no longer do is underestimate Donald J. Trump. Most did and he pulled off one of the greatest upsets in political history. The media, polls, Democrats and many Republicans were all wrong. Sometimes I wonder if Trump was the only one who believed he could prevail. 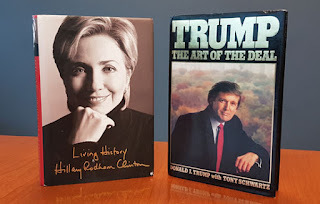 He had some help though with Clinton’s failed strategy – one that appeared to be ‘Let Trump be Trump’ in order to propel her to The White House. Second, his hustle was far more substantial than hers. Have you ever seen a 70 year old with so much energy for 18 months; doing 5-6 events a day in the home stretch of the election? Along with having his hand on the pulse of America, he also outworked Clinton. The most successful people in my inner circle are those who ‘grind’ daily. Trump showed that he could grind with the best of them. Finally, the ‘Reality TV Star’ words and/or actions (Sizzle) Trump provided throughout the battle made Clinton’s traditional campaign speeches and standard operational format look ho hum, although he was helped significantly by a media that made him 'must see TV'. One lesson we can learn about this election is that ‘Sizzle’ sells. Bill Clinton, Obama and Reagan had it and they all won. Not everyone has the personality, media savvy and confidence of Trump, although putting on a show or standing out can be a good way to enhance one’s popularity and/or image, particularly for those in the sales profession. I would encourage doing it in a positive and collaborative way, although one has to find and have faith in their own style. Another lesson is that hard work does pay off. Trump was in the heart of America more than Clinton and held more events and rallies. In my opinion, voters noticed that effort which I believe was a crucial part of his success. My PA friend kept echoing this same sentiment. The final and most important lesson is that one must ‘close the deal’, which in Trumps case meant winning the election. Having confidence about and focusing on the result of whatever you are doing is crucial. During the campaign, Trump talked about closing deals throughout his life again and again, but there were those who laughed and thought ‘yea right”. He certainly got the last laugh. I’m optimistic in general, along with hopeful that Trump’s 4 or 8 year run as President will be fruitful for most Americans. Our nation is more divided than ever though and Trump will need to be instrumental in helping to bridge that gap if he is too fully succeed. Everyone won’t get what they want from his time in office, but the results should and will be looked at closely, particularly since the Republicans have control of the House and Senate. President-Elect Trump is undoubtedly a great salesman. Whether he can be a great President remains to be seen. That journey begins on January 20, 2017. Always good to win a bet! I hope writing this article gave you the clarity you needed after such a historical event. I will keep hoping Trump has a positive impact from January 20 onwards. While I understand and even empathize with the resentment of many Trump and Sanders voters, I am profoundly saddened by Trump’s election. He is the wrong messenger for that movement and with him as the leader of it, he lessons the impact of an otherwise completely legitimate political movement. His election has diminished the office of the president and shaken me to the core. What is worse, is that it is frightening that support for such a despicable human being can remain a secret — even among family and friends. We have not learned the lessons of history. Though this is not surprising given that we do not invest in or value education, let alone facts. I am firmly in Charles Blow’s camp and I’m struggling with how to handle Trump voters among my friends and family, with the biggest question mark being whether I can still countenance them as friends and family. It’s tearing me up.